The music industry is always changing, from the original LP records first introduced in 1926 (that were as big as 16 inches in diameter) to now being able to download the world of music straight to your phone. Since people discovered downloading music through the internet the music industry has changed dramatically. It’s now at a situation where 98% of music singles bought are now downloads. The world of internet downloads laid berth to the Apple’s iTunes. Launched in 2001, it offered its users the ability to connect to the iTunes store to purchase and download music legally at a touch of a button. 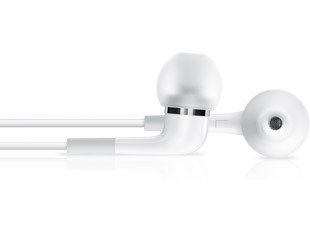 As of September 2010, 11.7 billion songs have been downloaded through iTunes. Its phenomenal success was helped by the release of the iPhone in January 2007 that was labelled the ‘revolutionary mobile phone’. A staggering fact is that 64% of iPhone users now consume online music in the United States. 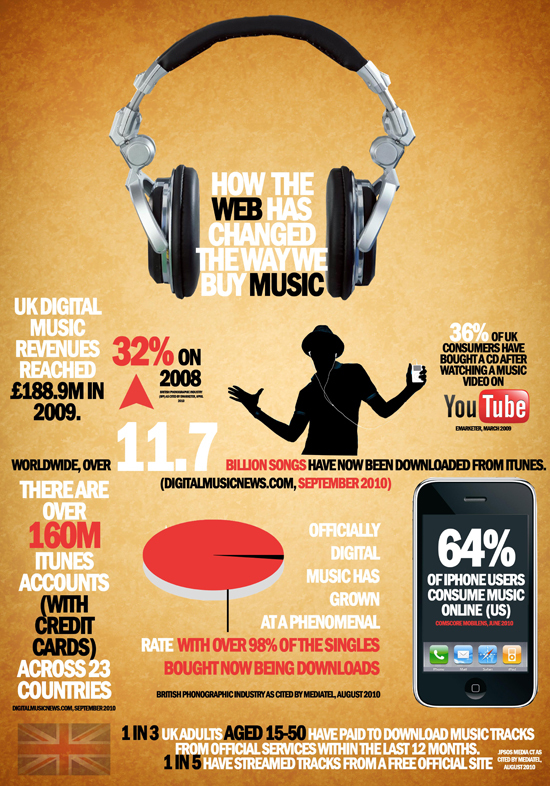 The below infographic courtesy of MoneySupermarket.com details how the web has changed the way we buy music and it contains some brilliant facts and figures. I still prefer to buy a lot of my music on CD, the sound of a CD is still superior to the sound of a compressed MP3 file, even if it is of a high quality, but then again, if CDs do finally start to fade away, I suppose I won’t have any other options! I caught an old episode of a BBC comedy last night, and as the character was rifling through a stack of CD cases I thought that they are already starting to look obscure and antiquated! personally im still lovin it digg in the cd or vinyl boxes at a recordstore itunes or other stores just can give u that feeling of buying music ! I hardly feel the difference between CD and MP3 audio quality. Regardless of that, I too prefer CD album, but due to its high price I have to compromise with digital MP3. Physical albums are facing hard time now, as there are lots of illegal song download sites and of course the legal ones. Let’s support original! iTunes FTW! One of the best infographs I’ve seen for the music industry. Next post: Apple to hold “Back to the Mac” event October 20th – new Mac’s? OS X 10.7 ‘Lion’?